It's that time again! Pet Fest is scheduled for Sunday, May 19th at Buttonwood Park in New Bedford, and this year's event promises to be an even bigger and better one! Why you ask? Because your Daily Dog Blog friends are participating! While the main attraction of Pet Fest is arguably the enjoyable dog walk that kicks off at 12:00 noon and circles the park, the Doggie Fashion Show is always a fun, unique event that draws a crowd as the walkers begin to complete the walk. And this year, the Daily Dog Blog has partnered with our friends at Go Fetch! to host a memorable fashion show we're calling, Dogue! After a really fun "model search," we gathered a great group of personable dogs and enthusiastic owners who will walk our runway sporting the latest and greatest in dog gear and accessories. Our Dogue show will kickoff around 1pm in the middle of the Pet Fest location. Just look for our red carpet! Don't forget that Pet Fest is also a great place to shop locally-made pet products, unique gift items and maybe even find your next best friend! We'll be featuring several adoptable dogs on the hunt for their forever homes in our fashion show, and many area rescue groups and shelters will be on hand with their available animals. We hope to see you this Sunday at Pet Fest! For more information, please check out the Coalition for Animals of Greater New Bedford's website. Owning a dog is a serious responsibility and commitment. There's the basic love and care - feeding, bathing, socializing, training and exercising, but then there's all the stuff that comes with owning a dog! From leashes and collars to brushes and bowls, owning a dog requires storing a lot of stuff around your home. And some stuff, like bowls and toys, are readily visible to anyone who visits your home. So I embarked on a mission to find stylish and functional products and methods of organization for the modern dog owner. This will be a weekly feature on the Daily Dog Blog, showcasing new and attractive products and methods of organization for the modern dog owner. Here's what I came up with this week for food storage. One of your dog's most basic needs is eating. And one of the things I hear dog owners constantly mentioning is the difficulty in storing their dog's food. 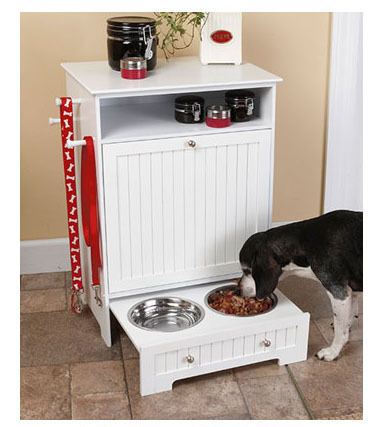 This is a great way to both store your dog's food and feed them! Are you more of a do-it-yourselfer? Take an old cabinet, pull out the bottom drawer, attach a board with two holes in it the size of your dog bowls, and voila! These are also both great options since the drawers can be pushed back in when necessary. Have more space in your kitchen and looking to do something truly stylish and custom? Take a peek at these beautiful kitchens will built-in storage solutions and eating stations for their fabulous pets. Now onto bowls. I've never cared for having ugly dog bowls and water dishes lying around. Here are some great options. With chevron being a wildly popular print right now, this pink version for $39 would fit the bill for any fashion enthusiast. GummiPets also released a line of adorable bowls with a variety of patterns sure to please any dog owner looking for some flavor to their pet's dishware. On the bottom row are two, great handmade bowls. Personally, I love anything monogrammed or personalized. And how great are the colors of the customized name bowl? The orange pattern bowl also comes in a variety of other colors. Another perk? These dishes are dishwasher safe! Owning a dog does not mean style and efficiency have to go out the window. Tune in next week for another edition of this special blog feature! Our Paws for Love "Yappy Hour" fundraiser event is just one week from today! This fun event is being held at Go Fetch! in New Bedford on Saturday, February 23rd from 4-6pm. Friendly dogs who are up-to-date on vaccinations are welcome to join their humans at this yappy hour style event. For just $15, folks can enjoy food, drinks and earn a chance to win some fantastic raffle prizes. Please join us at this fun event and help support our local no-kill shelter, Forever Paws! For full details and a list of raffle items, please view our official Facebook event. Call (508) 990-DOGS to reserve your tickets today! Ok, I know - no one likes to think about their dog no longer being with them. But the way I look at it, it is our responsibility as pet owners to make sure they have the happiest, most love-filled life they possibly can while we are lucky enough to enjoy their company. So, I've compiled a fun "bucket list" for dogs that could most certainly make any dog's tail wag with joy. Bury my most prized possession right in the middle of a garden. No one will suspect it's in there. Take at least one fantastic family Christmas photo. But please, no reindeer antlers! My dog friends will never let me live that down. Go swimming in the sea. And then come out all wet and salty and shake it off on everyone! Pick out my own toy at the pet store. Even if I choose the $15 dog toy that you know I will destroy in 2-minutes, let me do it just once! Eat a slice of pizza! I know you've told me pizza isn't for dogs, but pleaaaase can I just have one piece? Enjoy some doggy ice cream on a hot day! I've heard that Frosty Paws ice cream stuff is delicious! Become a social media sensation when you put a funny video of me online. Everyone knows I am cute. Why not share my cuteness? Roll around in that mud puddle! You can give me a bath later, I promise. Learn a new "trick" that makes my human smile! Run around like crazy with my friends at a dog park. Can you think of anything else we should all try to make sure we let our pets do once in a while? Share your ideas in our comment section below! You would rather sleep uncomfortably and wake up sore than move your dog from the bed. You job hunt for positions close enough to home so that you can run home during lunch to let the dog out. You schedule appointments and events around your dog's feeding schedule. You haven't been on a vacation in....you forgot how long...because you'd miss your dog too much or worry about putting them in a kennel. You go shopping and come home with another new dog toy and nothing else. The stuff on your fridge consist of postcards from your veterinarian for your dog's vaccines. While your friends carry photos of their children in their wallets, you have photos of your dog. Photos on your desk at work include your significant other and of course, your dog. Your weekends consist of errands and one or two fun things to do with your dog. You find yourself reading the ingredients of your dog's food more than you check the ingredients of your own food. You worry if your dog has enough friends. You feel a pang of guilt whenever you have to go somewhere without your dog. You leave the TV on when you have to leave your dog home alone, so they have something to entertain them and don't get lonely. Your dog sees their veterinarian more than you see your own doctor. Can you think of any other fun things to add to this list? Let us know in the comments section below! The cold weather and occasional snow doesn't mean that you can't enjoy the outside with your dog for the next few months. Some dogs thoroughly enjoy the cold weather and snow. In fact, veterinarians warn that dogs still need adequate exercise to maintain a healthy weight and keep boredom at bay during the winter. After all, a bored dog can become a destructive dog. Whether you venture into your own backyard or head to a dog-friendly local park, playing in the snow with your dog can be a lot of fun. Just be sure that if your dog is a small breed, ill, elderly, or a breed such as a Greyhound or Whippet that is slender and has short fur, you provide a warm coat or sweater for them. (Check out our blog, "Do Dogs Really Need Sweaters?" featured on the NewBedfordGuide.com) Booties are another option to keep your dog's paws dry and warm. Playing fetch in the snow with a brightly-colored ball can bring a lot of joy for your pooch. And if you have children, chasing them throughout mounds of snow is a great way to release some energy. Just make sure that when you return you wipe off your dog's paws, ears, face and coat, so that no ice becomes wedged in places that can cause frostbite. The winter months can be a great time to sign your dog up for some agility classes, which offer exercise and discipline during a time when your dog can become restless. These classes train your dog how to jump through hoops, walk through and over obstacles, and jump over things all while following your direction. The Potter League for Animals in Rhode Island offers a great variety of classes and fun activities for your dog. Petco also sometimes offers agility training. Call your local animal shelter or Petco or check their websites for more information. Perhaps your dog needs less disciplinary training and just needs more social interaction with other dogs? One great option is checking out Meetup. Meeting is an online database of events and groups organized by people like you! 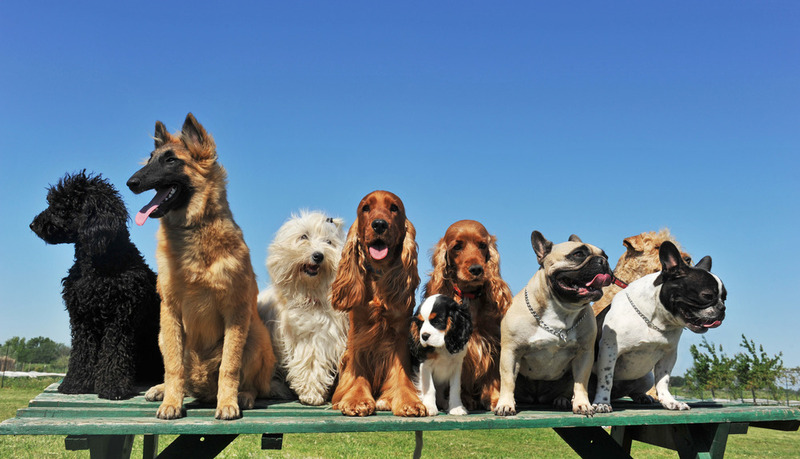 Just log on, choose the "Pets and Animals" category, choose the area to search in and you'll gain access to information about doggie play groups located in your community. The Potter League for Animals also offer some great play groups organized by age and size. Check out their class calendar for more information. And lastly, your local Petco offers doggie play groups as well. Check your local store's online calendar (here is the calendar for the North Dartmouth, MA location) or call to inquire. Dogs are so full of love, and they enjoy showing it. So for a fulfilling activity to do with your dog, consider volunteering with them! Winter can be a long, bleak season for many residents of communities like nursing homes, and a visit with a happy, furry pet can really brighten their spirits. Call your local nursing home or animal shelter to inquire about any volunteer opportunities that exist for you and your pet. In most cases, your dog may need to pass a behavioral test to ensure they will safely interact with strangers and will be comfortable and can follow basic commands. Or, consider just bringing them for a trip to visit an elderly relative! The happy reaction people will have when enjoying time with your pet will warm your heart and give purpose to your dog during the cold, winter months. And with New Year's quickly approaching, you know what that means -- New Year's resolutions. I don't typically make any resolutions but I thought it'd be fun to think about some resolutions for dogs and their owners. Perhaps the New Year is a good time to consider or look into pet insurance? In my case, Gadget was already 7 or so years old and had been diagnosed with diabetes before pet insurance really became available. If it had been an option when I got her, I would have definitely considered it, and it will be something I research closely for our next dog. Different insurance companies and policies offer different coverages obviously, but they range from reimbursement for behaviorial issues, tooth removal, accidents, emergencies, and major illnesses such as cancer. Depending on the company and the policy, you could gain peace of mind by insuring your pet for as little as $10 a month. Start by talking to your regular veterinarian to see what your options are, or start by doing research online. Many companies also offer online quotes. I think it would be safe to say that 90% of New Year's resolutions involve weight loss. The weight loss I am referring to now, however, is for dogs. Canine obesity is one of the fastest growing health issues in dogs today. As with people, all that extra weight can lead to a variety of diseases and other complications. In the most recent study, the Association for Pet Obesity Prevention found that 53% of adult dogs and 55% of cats are classified as overweight or obese. That means that in 2012, 88.4 million pets were overweight in the USA. All that extra weight and pressure on their joints can lead to osteoarthritis, diabetes, high blood pressure, breathing problems, kidney problems and overall a shorter life expectancy. Restricting your dog's diet can be challenging at first (mostly because of the guilt you may feel) but it truly is in your dog's best interest. Check out our previous blog on Dieting for Dogs for some tips to help you get started, and just stick with it! And as always, consult your regular veterinarian before making any changes to your pet's lifestyle. Perhaps you've been considering signing your dog up for some training. Have you considered registering for an AKC Canine Good Citizen class? This certification is widely regarded as the highest standard for the test of good dog behavior and some homeowner's insurance policies even offer discounts if your dog is in possession of this title. For more information on AKC Canine Good Citizen classes, contact your local Petco Dog Trainer or visit the AKC website. Do you have any other suggestions for New Year's resolutions for dogs and their humans? Leave them in our comment section! One of my favorite photos of my two favorites -- hubby and Gadget!With 2012 winding down, Yahoo.com reported the most popular names for your pups this year. If you were to yell Max or Bella in your local dog park you'd probably get 3 or 4 dogs running your way, as those were the top male and female dog names of the year. Charlie and Buddy were the next popular dog names for male pooches, while Lucy and Daisy followed Bella in popularity for female dogs. It would seem that names traditionally meant for humans are the new trend in dog names, while classics such as Rover and Fido are out. Personally, I've always liked original, clever dog names (I named my dog Gadget because she was a small, restless dog and people confused her original name, Gidget, for Digit). But I think no matter what you decide to name your dog, picking a name that you can live with and that suits the personality of your pet are the most important things to consider. Isn't it funny how after just a few months, your dog seems to "become" their name? I could never imagine Gadget being named anything other than Gadget now, and she certainly seems..like a Gadget! Share your clever dog names in our comment section! We could not be more pleased with how our first event, our Pup-a-Razzi Fundraiser, turned out. From the weather cooperating (mostly) to seeing both familiar and new faces (canine and human), the dailydogblog.org and Iris Images Photography had a pretty great weekend. We were successful in booking every single photo reservation for both Saturday and Sunday, and actually had a good number of walk-up appointments as well. In total, we put smiles on the faces of 43 dog owners during Pup-a-Razzi! Participants were very generous as well -- often donating more than the $10 fee to our cause and helping us fill a tub with cleaning supplies and dog food which will also be presented to Forever Paws Animal Shelter this weekend. Our total monetary donation amount is currently at $400, with several kind folks also offering to mail additional donation checks to us this week. We’ll follow up after we make the donation delivery to Forever Paws this weekend and let you know the end result of our Pup-a-Razzi Fundraiser. A BIG thank you to all those who participated/donated, and to Vanessa Machado from Iris Images Photography. Without you, this event would not have been possible. Here are a few photos that we snapped during the event. To see more photos and some teasers of the professional photos Vanessa took, head over to our Facebook page!